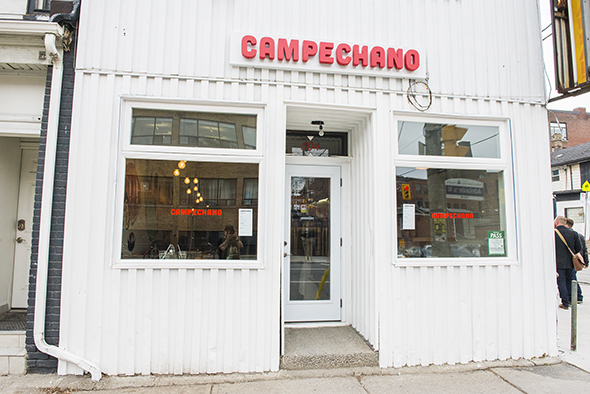 Campechano means no fuss. It's also a taqueria on Adelaide where the menu features half a dozen tacos, four quesadillas, a gauc, a ceviche, and a single dessert. 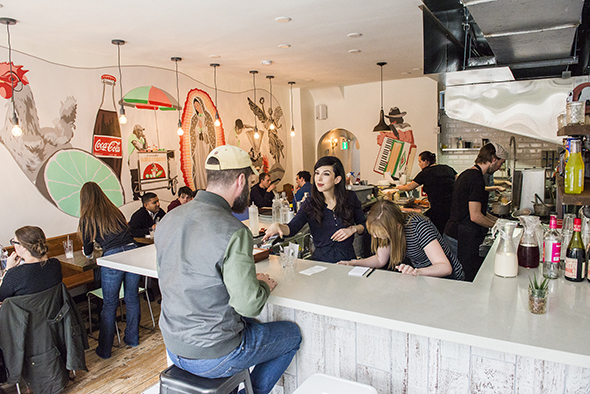 Owners Raena Fisher and Daniel Roe (ex- Black Hoof and La Carnita ) are backed by Roe's cousin Javier Flores who operates a number of taco shops in Mexico. They've gutted and converted the former Sadie's Diner into a casual setting to enjoy Mexican street foods. The space now features rounded archways, colourful murals and an open kitchen positioned up front. Seating is spread over two rooms at tables furnished with school chairs and dressed up with potted succulents. 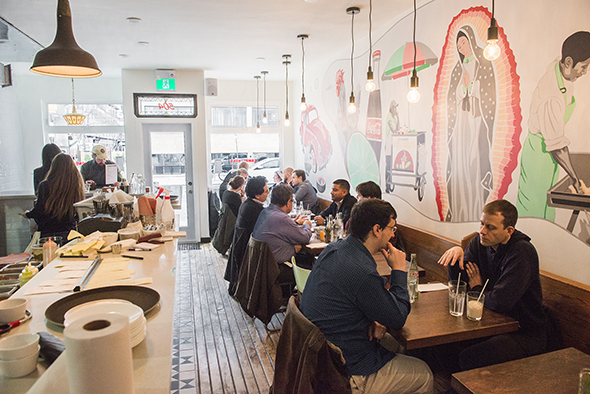 It's casual as the name suggests, and during lunch on weekdays it's positively bustling. 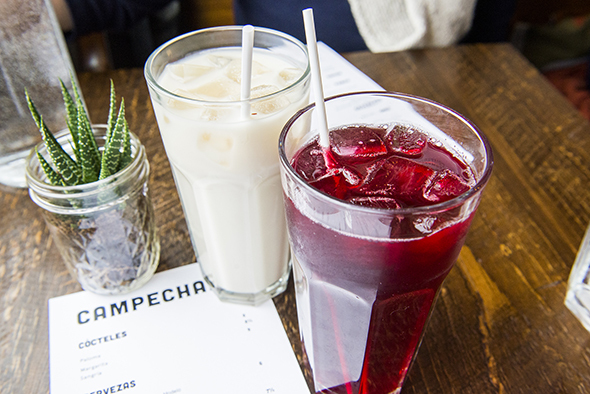 To drink, there are bottles of Mexican soda ($3.50) sweetened with sugar cane along with house-made aguas ($2.50) like jamaica , a steeped hibiscus flower tea, and horchata , a cinnamon-infused rice and milk beverage. 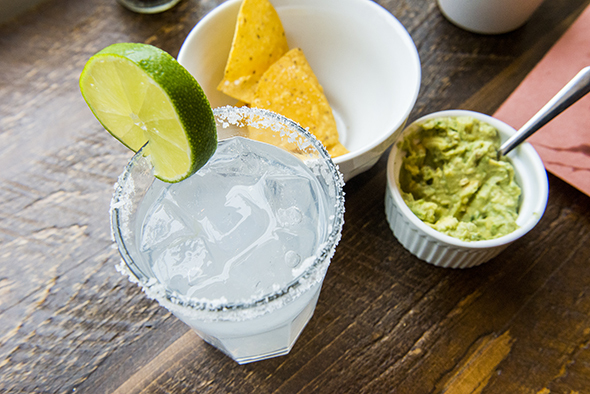 Those looking for something stronger can imbibe with a short list of cocktails featuring a paloma, a margarita, and a sangria priced between $8 and $9 each. There's also Mexican beers by the bottle ($6). The intent is to offer a couple draught selections in the future. 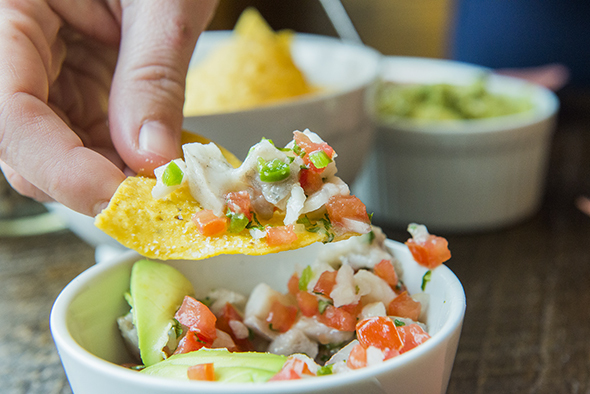 The menu opens with chip-dipping classics like guacamole ($6) and ceviche ($8). The former is a creamy all-avocado mash, while the latter features sea bass (sometimes halibut) marinated in lime, gently seasoned, mixed with pico de gallo and then topped with a few slices of avocado. 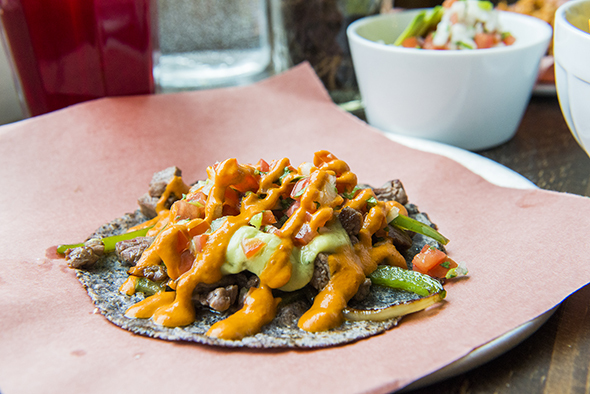 When it comes to tacos, you'll discover that the tortillas are impressively fresh and the toppings, while bold in flavours, don't rely on crema or fancy garnishes. 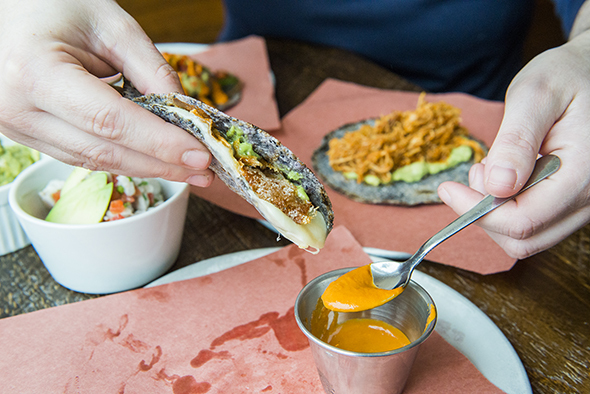 For Fisher and Roe, it's the tortillas that are the foundation of a good taco. 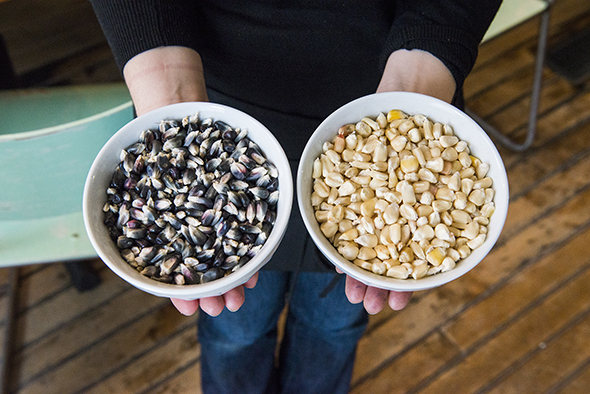 They import blue and white corn from farmers in Mexico before soaking overnight, grinding kernels, kneading and measuring out dough and then finally pressing each tortilla to order. They're slightly thicker than your average taco shell. Doubling up is unnecessary. They're loaded with things like shrimp ($4.50) in smokey chipotle sauce with pineapple salsa over a base of guacamole. There's a bistec taco ($4.50) too. This one features seared sirloin cap drizzled with green tomatillo salsa and red morita chili salsa then finished with diced tomatoes, cilantro and onions. 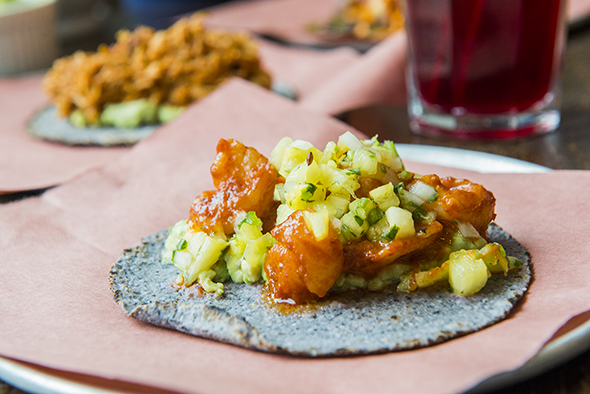 The tinga de pollo taco ($4) is an example of the house guisados , stewed meats. In this case it starts with cooked chicken that's shredded and then stewed with tomatoes, onions and morita chilis. 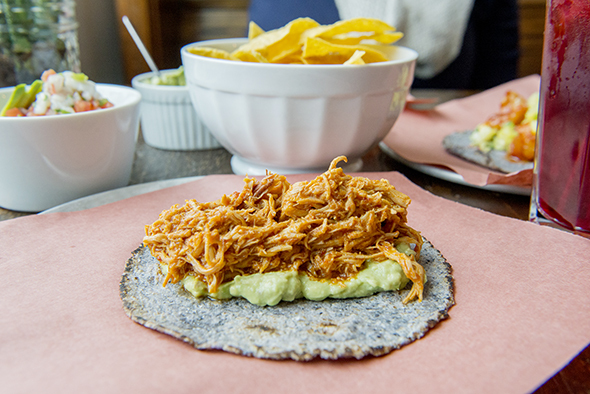 It's piled over a tortilla smeared with guacamole and served just like that. Surprisingly, for a sauceless taco, the meat is incredibly moist. The lineup of quesadillas ($5.50 to $7) all rely on Oaxaca cheese that gets gooey and crisps when it comes in contact with griddle. I try the Sencilla, a tortilla folded around cheese and salsa, but other options include mushrooms, chorizo or steak. The menu might be tweaked here and there, and the occasional feature should be expected, but it's not impossible to sample the whole menu in just one or two visits.